Practice reading with Goldilocks and the Magic Apples! Goldilocks and two friends visit the bears' house and leave replacement items for those they use. 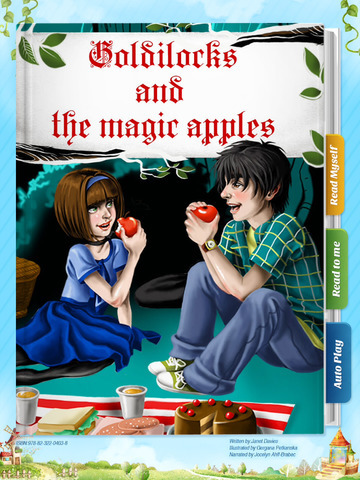 Goldilocks and the Magic Apples helps your kids learn to read with karaoke-style narration and callouts to discover new words! Two friends plan a forest picnic. Goldilocks finds them and invites them to join her to visit the three bears. Under a magic apple spell, the kids eat the bears' porridge, sit in the bears' chairs, and take naps in the bears' beds. They leave a picnic lunch to replace the porridge and a folding chair to replace one they have broken. They sneak out of the house on a rope when the bears return home.